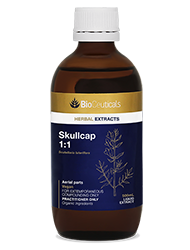 Skullcap is a perennial that grows up to 1.5m tall and prefers damp land, meadows and ditches. It has pale blue flowers that bloom in pairs just above the tooth-edged leaves that grow opposite each other on short stalks and its botanical name, Scutellaria lateriflora is derived from the Latin ‘scutella ‘meaning ‘small dish’ to describe the shape of its seed pods, and the Latin ‘lateriflora’ meaning ‘flowering on the sides’ to describe its floral configuration on one side of the plants racemes. The common name, skullcap, describes the helmet-like shape of the flowers themselves. Skullcap leaves, prepared as a water infusion, were widely used by the Cherokee and other Northern American indigenous tribes as a sacred herb in ceremonies that marked the transition into womanhood for young girls. Indigenous American people also utilised the roots of the herb, using decoctions to treat a variety of conditions. Solvents: 45% organic cane ethanol, 55% mountain spring water. Recommended dose: 15-30mL per week. 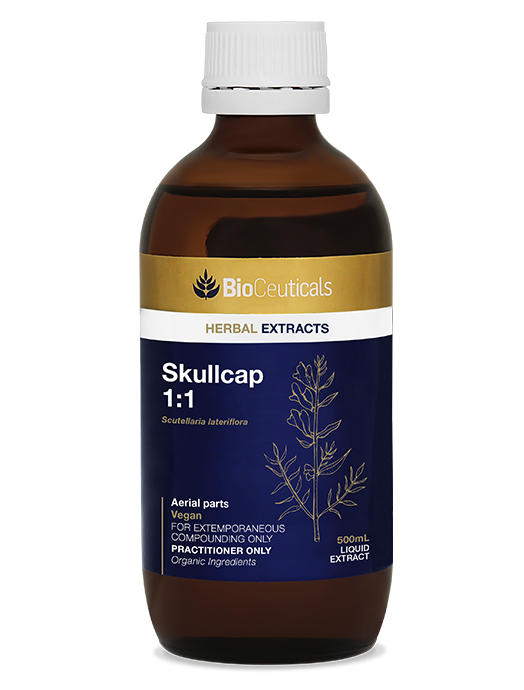 For further education and research, refer to the BioCeuticals Skullcap Monograph.